0n the Air Services Memorial at Arras there are about 1,000 names of FRC, RNAS and RAF personnel with no known grave. On the side facing you as you approach the memorial are recorded members of the RFC, with Lanoe Hawker VC as the top name and then descending in rank order. The right face of the monument records the balance of the RFC casualties. The back face has the names of the RAF casualties with the top name being Major R R Barker and the next Major Mick Mannock VC. The left face has the balance RAF missing, plus those of Canada, Australia, New Zealand, South Africa and India. On the right hand side of the monument almost at the bottom is the name of Air Mechanic Second Class H. H. Bright who was the only air mechanic killed as a pilot in the British flying service and his story is a sad one. 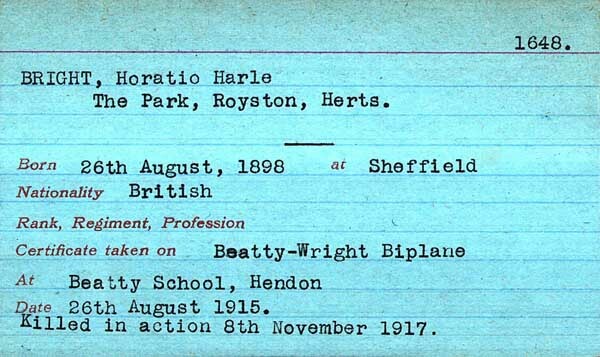 Horatio Harle Bright was born in Sheffield on 26 August 1898. He attended Sherborne Preparatory School and Marlborough and was still at school in October 1914. Volunteering for the RFC, he was instructed to join at Brooklands on 1 st July 1915. He was posted to Netheravon on 11th August 1915 but the War Office did not realise he was only sixteen years of age! Correspondence passed between the Deputy Director of Military Aeronautics, Bright's father and the Royal Aero Club. His father wrote to the military, stating he would not attribute any blame upon the government if his son was injured, as long as he could continue flying. The Royal Aeronautical Club was prepared to issue Bright's 'ticket' if the War Office accepted him. In the event, the powers that be declined, and Bright's Royal Aero Club certificate, No. 1648, was issued on his 17th birthday, 26th August 1915. He graduated from CFC on 19th October and arrived in France on 29th October with a posting to 6 Squadron RFC. After six months with them he joined 1 Squadron but was only there for two weeks, before transferring to 29th Squadron. Hopitalised in July and September, he left this unit on 6th September 1916 for a medical board. After a bout of influenza, he joined the Aeronautical Inspection Department at Filton, near Bristol, as a test pilot, on Boxing Day 1916. Unfortunately for reasons unknown, Bright's behaviour became erratic. There were complaints of extremely dangerous flying, such that he was, after several warnings, forbidden to fly by the officer commanding Filton. He was also forbidden to use the officers mess on account of passing worthless cheques and was taking women into Filton and giving them unofficial flights. In addition, he was absent on a number of occasions. On 29th May 1917 he was arrested and three days later tried by General Court Martial. There were two charge sheets, involving a total of 8 charges. Four of these involved having in his possession photographs of various parts of Filton and Bristol, then showing them to unauthorised individuals in such a way that it was calculated to be useful to the enemy. Of the eight charges he was convicted of six of them, he was sentenced to cashiered and imprisoned for twelve months without hard labour. On the recommendation of General Officer Commanding, Southern Command, the imprisonment was remitted due to Bright's young age and war service and the fact that there was no traitorous intent. As far as the photography charges, he was deemed to have behaved with extraordinary folly. On 23rd August the Director of Recruiting, 16th Recruiting Area, at Bedford, attempted to contact Bright but he had already enlisted in the RFC and on 6th September 1917 proceeded to France. Joining 60 Squadron at Ste Marie-Cappel he carried out his first practise flight on 22nd September. Later that day he flew on Offensive Patrol, from which he had to return temporarily, due to Vickers machine gun trouble. In the evening he delivered a new machine from No. 1 Aircraft Depot. St. Omer to the squadron. At 0900 hours the next day, he left on a five man patrol, led by the great New Zealand ace Captain Grid Caldwell, from which he failed to return. Nobody saw what happened to him and there does not seem to be a relevant claim from the German side. Airfileds and Airmen (Arras) by Mike O'Connor.